They call the Canadian Grand Prix the Monaco of North America. 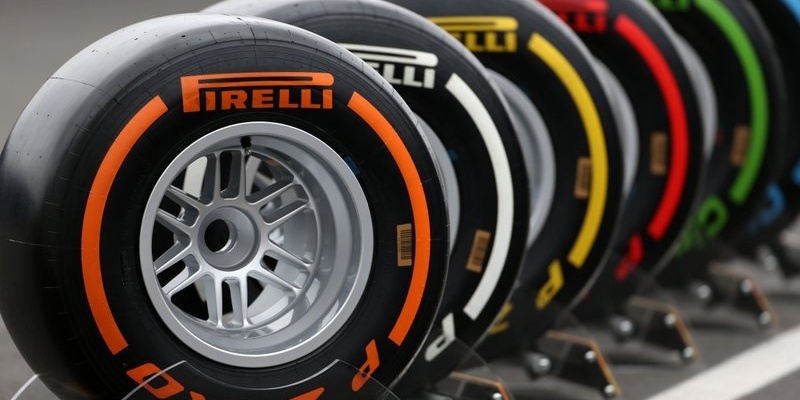 And just like Monaco, Pirelli is bringing the softest tyre compounds to Montreal: the red Supersofts, the purple Ultrasofts and the pink Hypersofts. Your correspondent was at the track in person to bring you the latest news in tyre usage. During free practice 3, the teams were running the Hypersoft (softest compound, most rapidly degrading) in qualifying simulation runs. As they moved to qualifying, the teams were all running the Hypersoft during Q1. They were just trying to set top 15 times and be done with it and move on to Q2. Strategy really came into play in Q2. The top 10 drivers have to start the race on the tyres on which they set their fastest lap in Q2. Not the same type of tyre, the same actual set of four pieces of rubber. So sometimes a team will try to use a harder tyre in Q2, knowing that it is not quite as fast, but also knowing that if they can make it work, then they get to use the harder tyre in the race, where the degradation of the softer tyre would become a liability. Only the top teams can try this strategy. The Midfield teams would never make it into the top 10 in Q2 (and thus into Q3) on the slower, harder tyres. But we did see Mercedes and Ferrari leave the pits on the relatively harder purple Ultrasoft tyres in Q2. They set top 10 times on those tires and moved onto Q3. As the last of the “Big Three” teams, we also expected Red Bull to run the purple tyres. But they didn’t. Instead, Red Bull was out setting their fast laps on the pink Hypersofts. So that means tomorrow, we are going to see the Ferraris and Mercedes starting on the purple tyres, which may be a bit slower, but will last longer. On the other hand, the Red Bulls will be start on the fast Hypersofts. 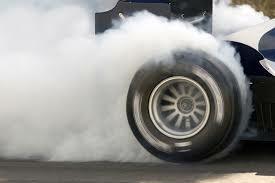 In order to make this work, the Red Bulls will have to make some moves on the opening laps so they can get into clean air and take advantage of their fast tyres. So expect Max Verstappen (starting P3) to put Bottas (P2) and Vettel (P1) under pressure and Daniel Ricciardo (P6) to put Raikkonen (P5) and Hamilton (P4) under the gun. It could lead to some real excitement in the first five laps. During the race, we could see Ferrari and Mercedes try to take advantage of their durable starting tyres and make the race a one-stop affair. Red Bull was gentle on the Hypersofts during the free practices, but it looks like a two-stop race for them. Further back on the grid, cars that are starting P11 through P20 will have their choice of starting tyre. Expect to see durability favoured over the raw speed of the Hypersoft. 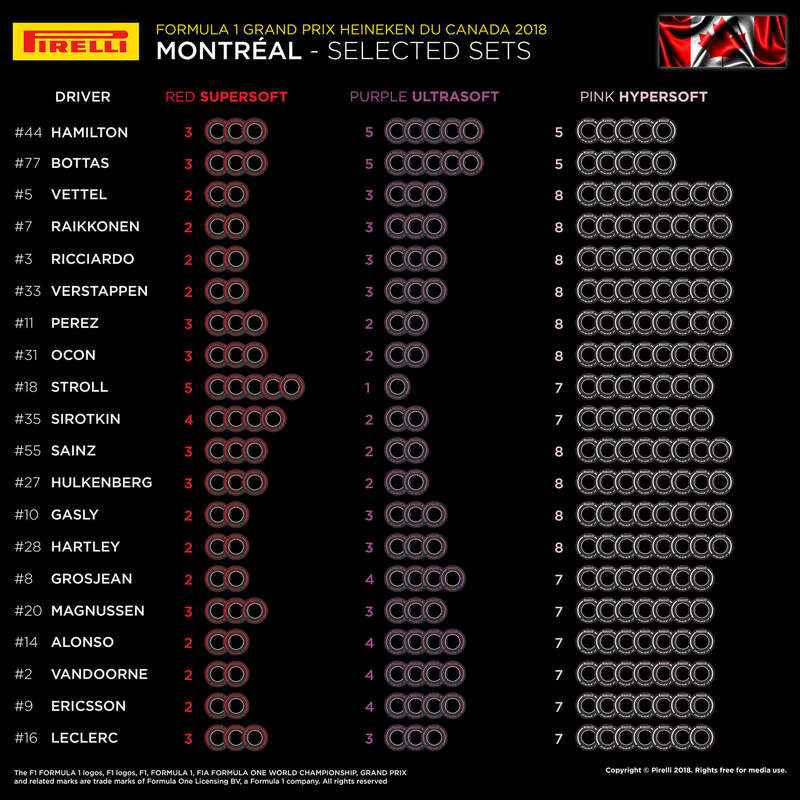 Unlike Monaco, where the teams absolutely loaded up on the softest compound, in Montreal, they have generally selected balanced allocations. Expect a red and purple day. Next Post:How to Start Your Formula One Car — Special Guest Blog!